Civic leaders in Detroit’s hot Midtown district last week were celebrating the latest additions to the neighborhood’s stock of residential and retail space. Last week, a funders recognition ceremony was held to mark the opening of the Woodward Garden Apartments project at 3909 Woodward. The $12.6-million project has created 61 mixed-income residential apartments, an outside garden space and 11,200 square feet of ground-floor commercial space. The project was designed by McIntosh Poris Associates architects and built by the Monahan Co. 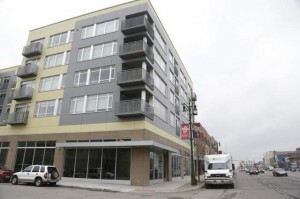 It was developed by partners George Stewart, Michael Byrd and William Mosely, who have spent 10 years redeveloping that block of Woodward with the help of the nonprofit civic group Midtown Detroit Inc.
That block is now also home to a 300-space parking garage and about 82,000 square feet of office and commercial space housing Great Lakes Coffee, Midtown Detroit, the Kresge Foundation, Wayne State University, the Garden Theater and the Grille Midtown restaurant. “The Woodward Gardens Block Project is a great project that symbolizes all of us working together as a team, supporting each other and advocating for funding,” said Sue Mosey, president of Midtown Detroit. Funding for the project included a $1.8-million bridge loan from the nonprofit Local Initiatives Support Corp. (LISC), working with State Farm. “We are excited to see the Woodward Corridor come alive and become a neighborhood of opportunity,” said Tahirih Ziegler, executive director of Detroit LISC. Meanwhile, the upbeat Shinola operation that successfully launched its line of watches and other luxury goods a couple of years ago in Detroit announced last week it was opening a second store known as Willys Detroit near its current Shinola retail space in Midtown. Located at 441 W. Canfield in the Willys Overland Building, which currently houses Shinola and Run Detroit, the new 2,900-square-foot Willys Detroit shop will open in June and feature an assortment of fashion and home brands. Among those: Filson, a Seattle manufacturer of outdoor products; Steven Alan, a clothing line from New York; Clare V, a maker of handbags and accessories crafted in Los Angeles; and Mollusk, a surf wear company based in San Francisco and Venice Beach, Calif.